Step 2 of this process has proven to be more difficult then expected. I have realized that my iPhone is my lifeline… after my wife of course. I almost can’t put this thing down. I’m sitting down watching TV, of course i’m tweeting/facebook/playing a game. I’m sitting on the porcelain throne, well of course what is the only thing to be doing during that time? As I continue to try and push through this process, I’ve realized just how much time I am on the phone. I have got to figure out some way to put it down. My phone goes off every minute with another tweet or someone commented on facebook or there is breaking news. I need to get out of this mentality that I must know what is going on in the world and always connected. I think I’ll need something to help out the withdrawls of this step! 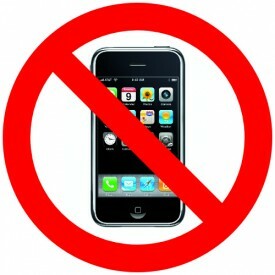 I try to limit my use of a smartphone to when Isaac’s napping/sleeping, playing with mommy or off at school. Granted it doesn’t give me all day to do it, but I just remind myself that I’d rather have one relationship with my son than with 100 people online.